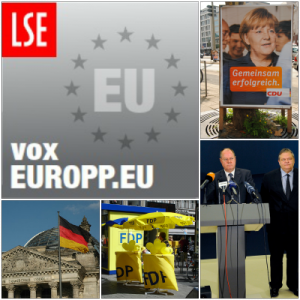 voxEUROPP, LSE EUROPP blog’s podcast, showcases commentary from academic experts from across Europe on the latest issues facing Europe and the EU. Published each month on EUROPP, iTunes, Soundcloud and LSE’s podcast channel, we aim to bring listeners the best in expert commentary on European governance, economics, politics, culture and society. Each podcast showcases two interviews under a major theme facing Europe today. Episodes will also feature the segment ‘Future of Europe’, where we ask academics to imagine what their ideal future for Europe might be. 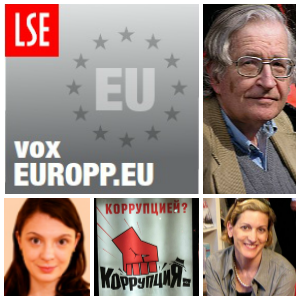 You can subscribe to voxEUROPP podcasts in three different ways: on iTunes, on Soundcloud, or via RSS. Click the links below to access each site’s subscription page or download episodes individually by scrolling through the list of past podcasts on this page. Germany heads to the polls on September 22nd in elections that are being closely followed in Europe and beyond. With doubts over Greek debt and economic problems across Southern Europe, these elections are incredibly important to the future of the Eurozone. LSE Senior Lecturer in Political Economy, Waltraud Schelkle, examines the meaning of the elections for the EU. Patricia Hogwood of the University of Westminster takes a closer look at the election campaign and other emerging parties, and world renowned German sociologist, Ulrich Beck, tells us why Europe should reinvent modernity. Presented by Chris Gilson. Produced by Cheryl Brumley. Other Contributors: Stuart Brown, Waltraud Schelkle, Patricia Howood and Ulrich Beck. Music and sound came courtesy of the following users at freesound.org: bebeto (loop022); suonho (memorymoon-pad and abstract-electrofunkbreak); and the following users from the FreeMusicArchive.org: Mermonte (Monte); Podington Bear (Easy-going); Ghost and the Song (Ou-Inme). Collage photos: Angela Merkel: Marcus Yorke, Peer Steinbrück: ΠΑΣΟΚ; FDP: Eoghan OLionnain; Bundestag: baracoder. Published 16 July 2013. Podcast 3: What does it mean to be European? 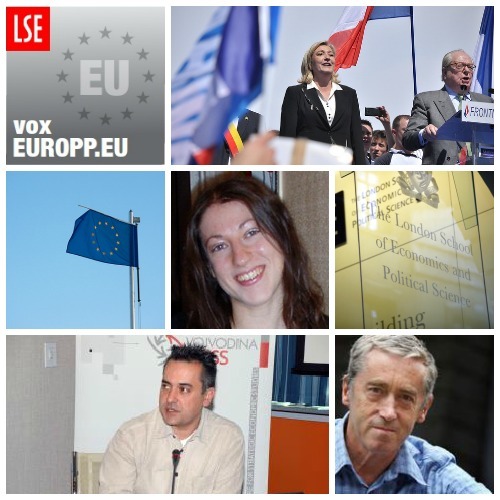 In this voxEUROPP episode we hear from renowned philosophers and historians about what it means to be ‘European today’. Simon Glendinning, LSE Reader in European Philosophy, talks about EU ‘experimenters’, a third group which sits between dogmatists and skeptics. 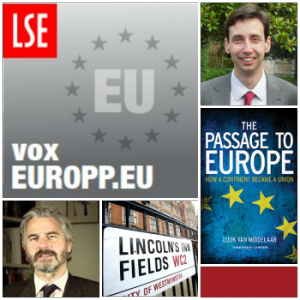 Paul Stock, LSE Lecturer in Early Modern International History, discusses how non-elitist voices can expand the notion of ‘Europeanness’ and Luuk van Middelaar speaks about his award-wining book in our ‘Future of Europe’ segment. Presented by Chris Gilson. Produced by Cheryl Brumley. Other Contributors: Simon Glendinning, Paul Stock, Luuk van Middelaar, Stuart Brown. Music and sound came courtesy of the following users at freesound.org: bebeto (loop022); suonho (memorymoon-pad and abstract-electrofunkbreak); and the following users from the FreeMusicArchive.org: Mermonte (Monte); Podington Bear (Easy-going). Published 13 June 2013. In this voxEUROPP episode we hear from specialists on politics in Eastern Europe and take an in-depth look at Europe’s austerity policies. Anne Applebaum, LSE’s 2012-2013 Philippe Roman Chair in History and International Affairs, speaks about the overreaching effects of ‘Putinsim’ on Russia’s economic system and democratic processes. Romanian Expert and LSE PhD student, Clara Volintiru discusses the referendum on the country’s presidency and whether or not the EU could do more to support democracy in the country. Renowned political critic Professor Noam Chomsky talks about the long-term effects of European austerity policy in our final “Future of Europe” segment. Presented by Chris Gilson. Produced by Cheryl Brumley. Other Contributors: Stuart Brown, Anne Applebaum, Clara Volintiru, Noam Chomsky. Music and sound came courtesy of the following users at freesound.org: bebeto (loop022); suonho (memorymoon-pad and abstract-electrofunkbreak); and the following users from the FreeMusicArchive.org: Megatroid (Ego Grinding — CC-BY-NC-SA); Broke for Free (As Colorful As Ever — BY-NC). Published 21st March 2012. We hear from specialists on the rise of the far right in Europe and examine the extent to which the growing popularity of right movements is linked to austerity. LSE Senior Lecturer in Political Economy of South Eastern Europe, Vassilis Monastiriotis, traces the rise of the Golden Dawn Party in Greece. Reader in politics at Queen Mary University, Rainbow Murray, speaks to us about France’s the Front National and why the apple may not fall too far from the Le Pen family tree. Professor Paul De Grauwe, Head of LSE’s European Institute speaks about his ideal Europe and why the financial crisis should lead to greater political unification. Presented by Chris Gilson. Produced by Cheryl Brumley. Other Contributors: Stuart Brown, Vassilis Monastriotis, Rainbow Murray, Paul de Grauwe. Music and sound came courtesy of the following users at freesound.org: bebeto (loop022); suonho (memorymoon-pad and abstract-electrofunkbreak); and the following users from the FreeMusicArchive.org: ghost and the song (Ou Inme); Super Flower (Camden Park). Published 10th December 2012.